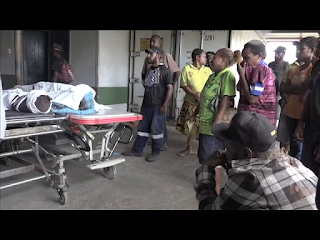 Two primary school teachers serving in rural Kabwum district were killed instantly along with their two children and an elderly woman relative, in what is now considered one of the worst road accidents in Morobe province, NBC reports. With the unofficial and unconfirmed death toll last registered at seven, the Nasupum crash is one of the worst road accident in Morobe province, following the worst national road accident in 2010 where 40 people died after two Route-100 Coaster buses crashed into each other at Ragiampum village near Watarais junction in the Markham valley. Among the dead, is the Munga family of four, parents Yaing and Brenda Munga both serving primary school teachers and their three-year-son Nathaniel and two-year-old daughter, Justline. The two teachers of Tauga Primary School in Komba Local Level Government Area in Kabwum district, were travelling from Lae to Nadzab ariport to catch a light aircraft flight to go back to Kabwum with the intention to settle in and resume duties early. They were accompanied also by an elderly woman relative who was the children’s babysitter, and were travelling in a five-door Toyota Landcruiser vechicle which collided with a 15-seater bus near Nasuapum village, located halfway between Lae and Nadzab. They were part of the first seven dead bodies rushed down to Lae along with some other occupants of both vehicles, most of whom were in serious conditions. Michael Gerson, who oversees the districts’ eduation standards as the Provincial Examinations Cordinator, says the two teachers who were killed in that tragic road accident were part of the team of hardworking and committed teachers serving in Kabwum, whose contribution resulted in the district topping the province academically in 2017. Relative and colleague teacher, Kevin Panpan, and Mr Gerson described their deaths as unexpected and unnecesary and say it is a big loss to the people of Kabwum and the Education division.